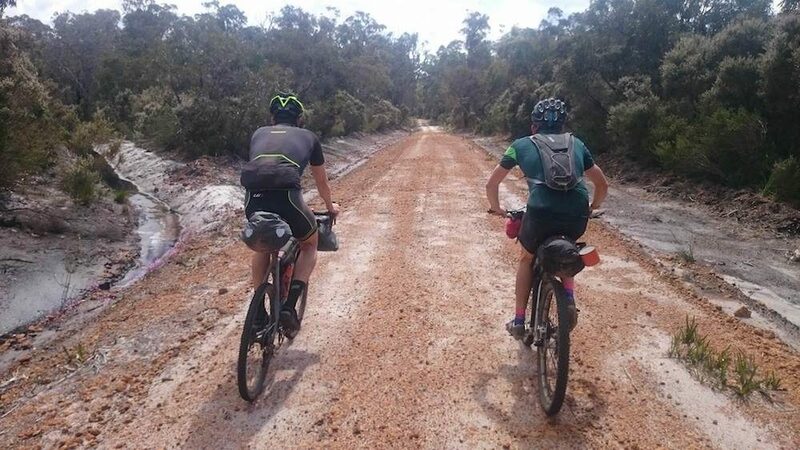 The Munda Biddi Trail is an off-road cycling track in Western Australia, and is the longest track of its kind in the world. 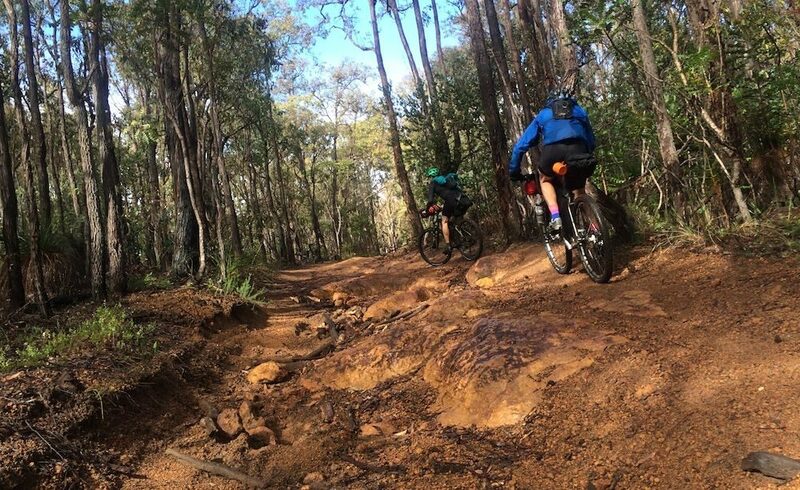 The name ‘Munda Biddi’ is derived from the local Aboriginal language, translating to ‘path through the forest’. 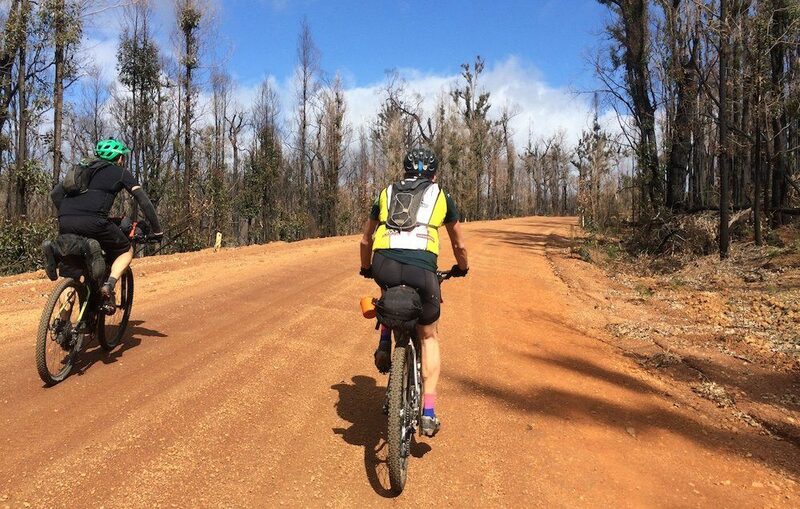 This unique path winds through some of the most beautiful sections of forest and bushland in Australia. 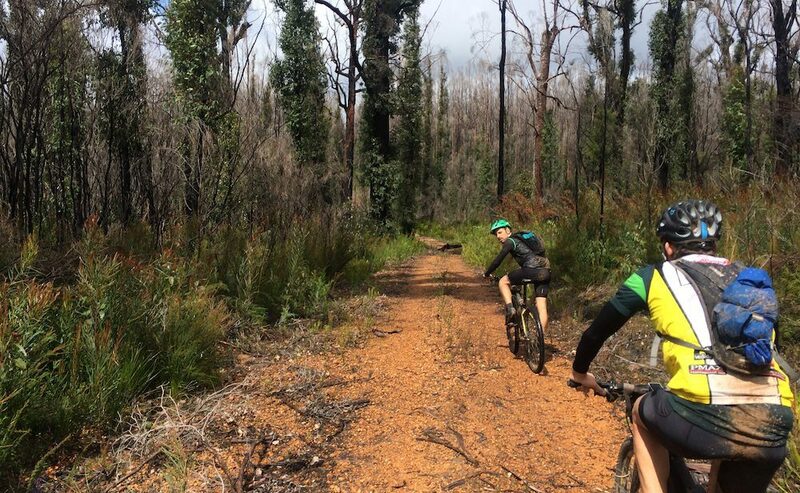 As a majority off-road trail it offers a mixture of dirt roads and singletrack, and very few sealed sectors in between. 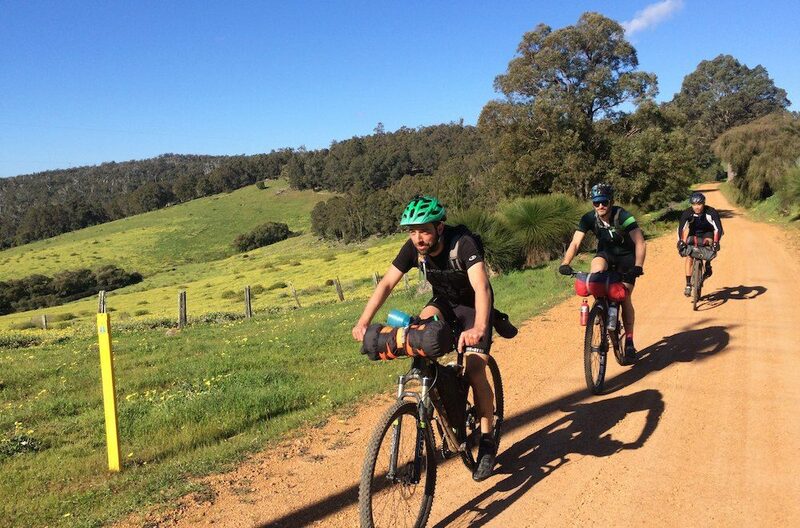 There are towns every 50-100km for accommodation, food and supplies, as well as lots of campsites along the trail. 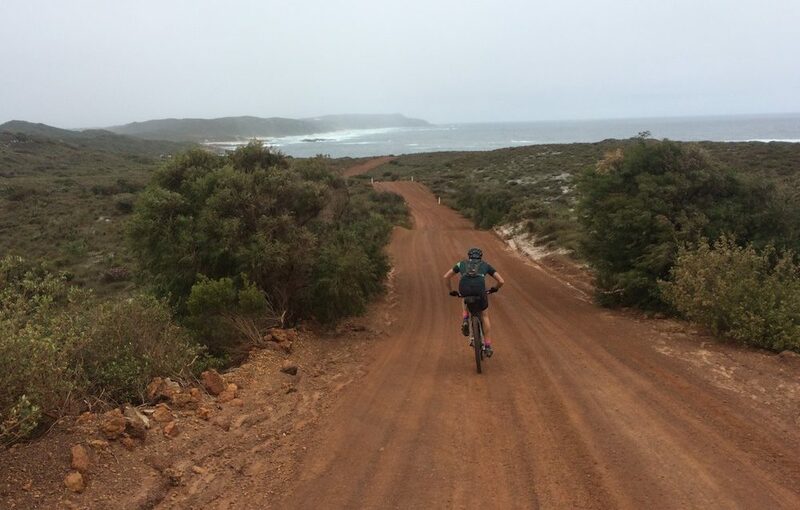 My friend Campbell moved over to Western Australia this year for work, so this was the perfect excuse to complete this 1000km trail with him. 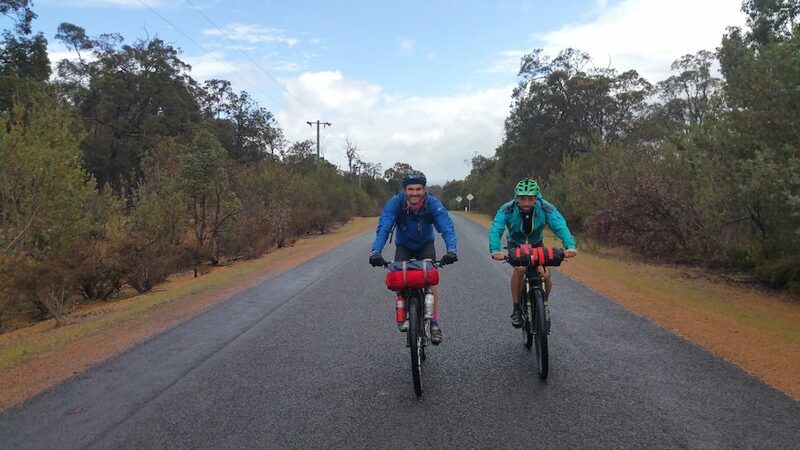 Mutual friends Erin and SV (Curve Cycling) were able to get the time off for this bikepacking expedition too. I decided to pack ultra-minimally into a set of bikepacking bags. 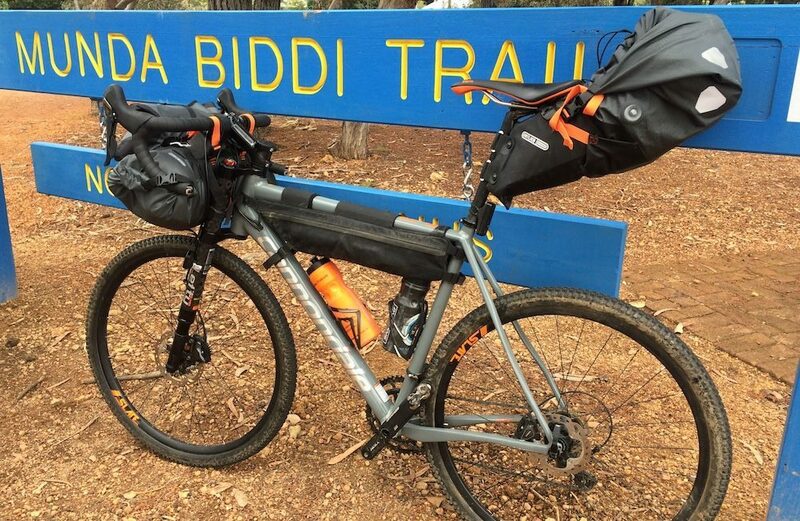 My estimated gear weight was sub-10kg (22lbs). 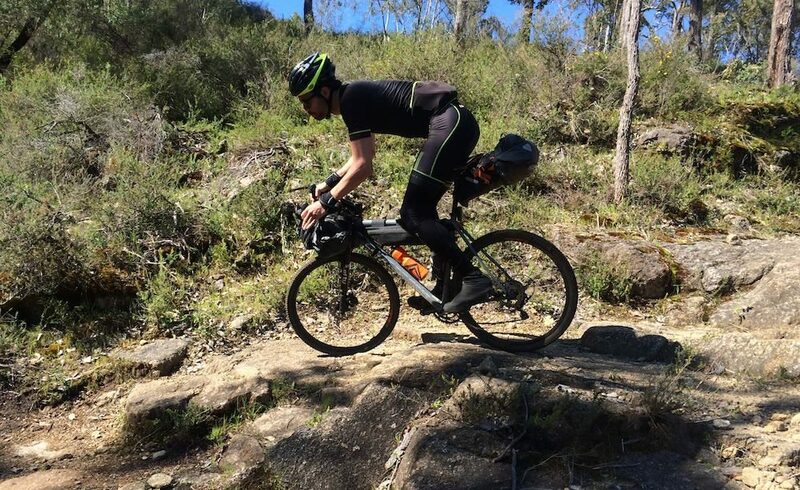 Along with the light kit, I thought I’d bring the fastest off-road capable bike I could think of – the Cannondale Slate adventure bike (review HERE). Flying into Perth airport from the east coast of Australia, I was eager to see how the landscape was different some 3500km away from home. To give you an idea of scale, this is the same distance as crossing Europe (Madrid to Istanbul), or the USA (Florida to California). 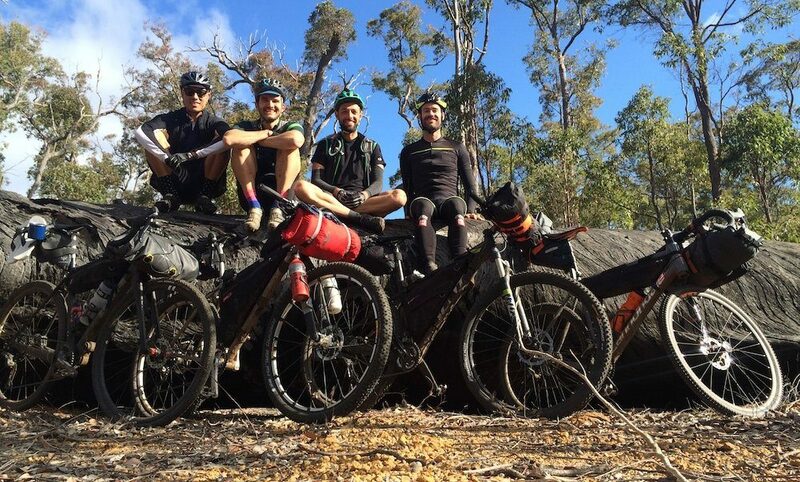 Down the bottom of this page is some important trail advice. 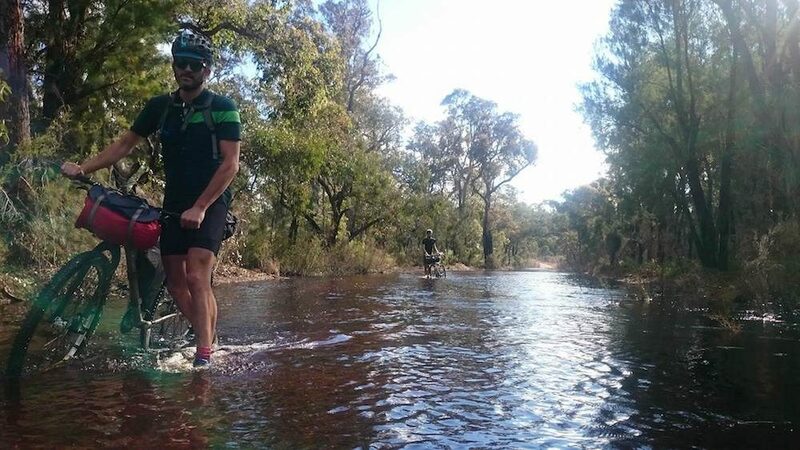 If you’re planning on doing this trail, please read it! We were all pretty eager to go at the Northern Terminus. But then we realised that it wasn’t going to be a walk in the park. Well, it kinda was. 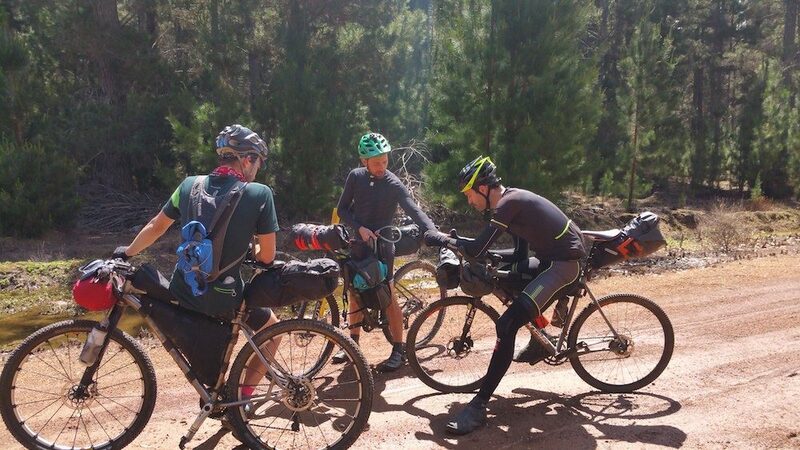 Two of us had mountain bikes and two had adventure road bikes. 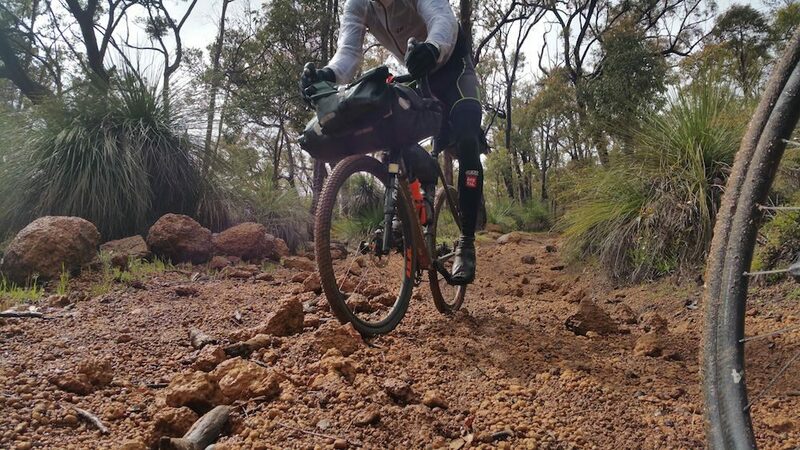 The road bikes didn’t have small enough gearing or wide enough tyres for this terrain! Then it started to rain and hail. 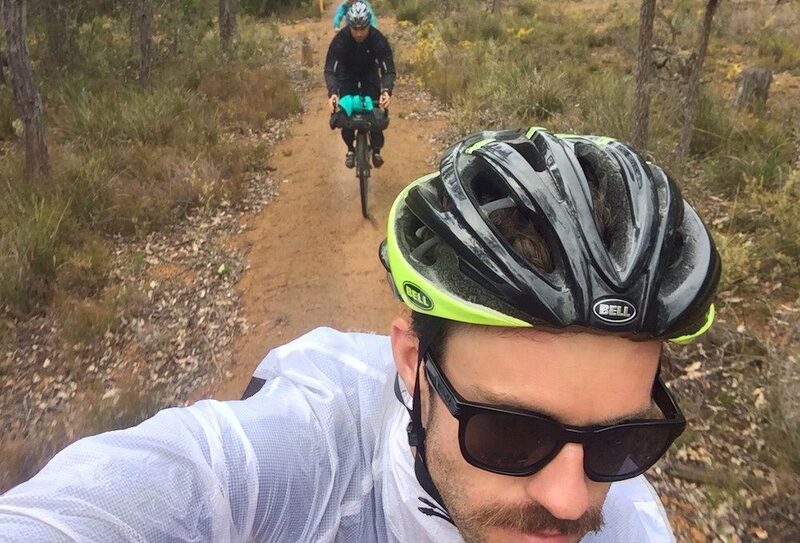 We had to put our heads down and our cameras away, so we could get dry in Jarrahdale. 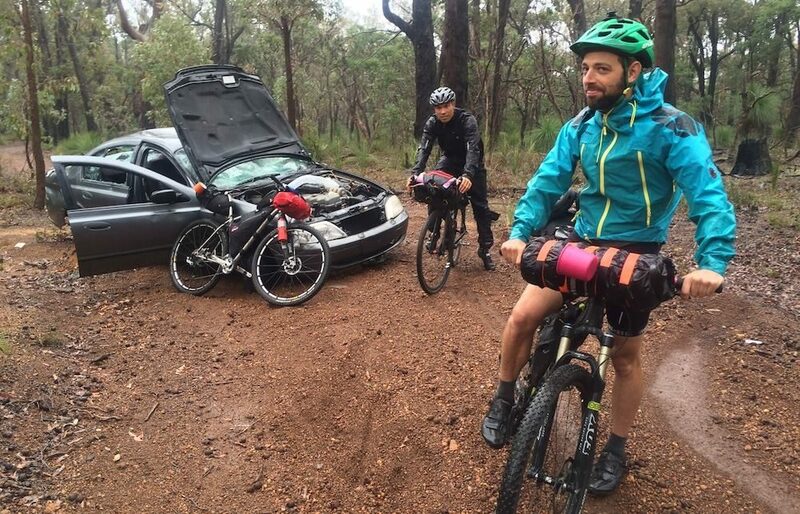 Out of Jarrahdale we found a dumped car on the trail. And… way more hills for SV and I to walk up. Campbell and Erin couldn’t be happier with their bike choices! 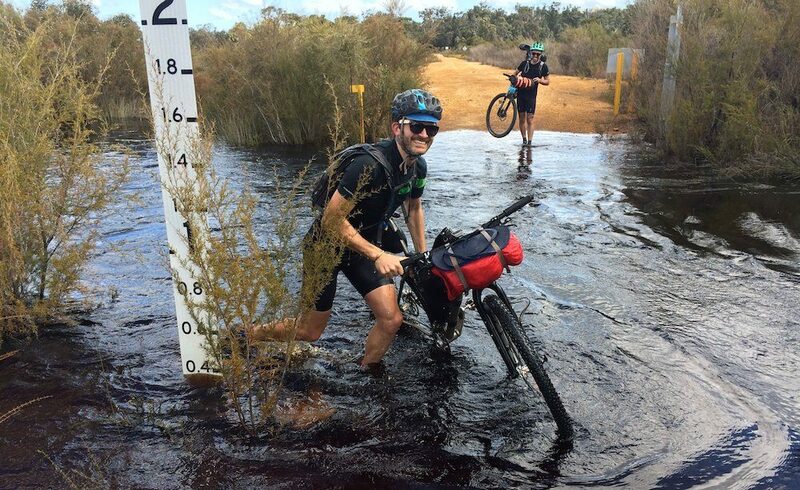 Given all of the unseasonal rain, there was SO MUCH water on the trail. But the sun would come out and everything would be nice again! Our average speed over the first few days was below 15km/h including stops. 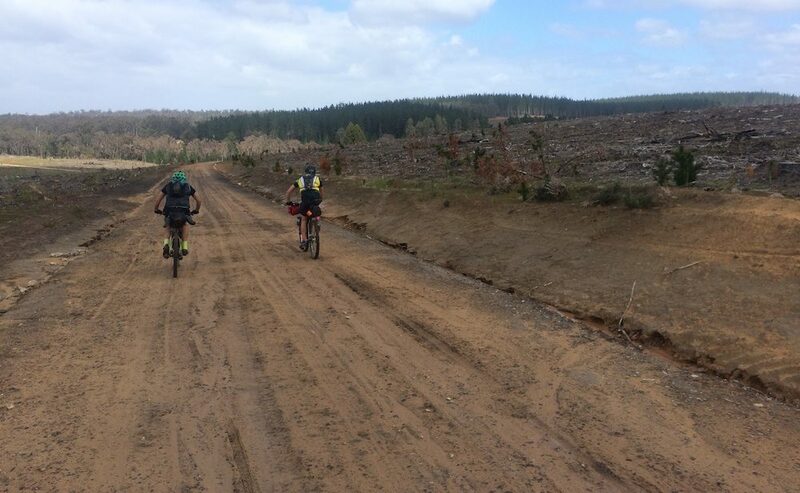 The bitumen sections helped us go a bit faster. 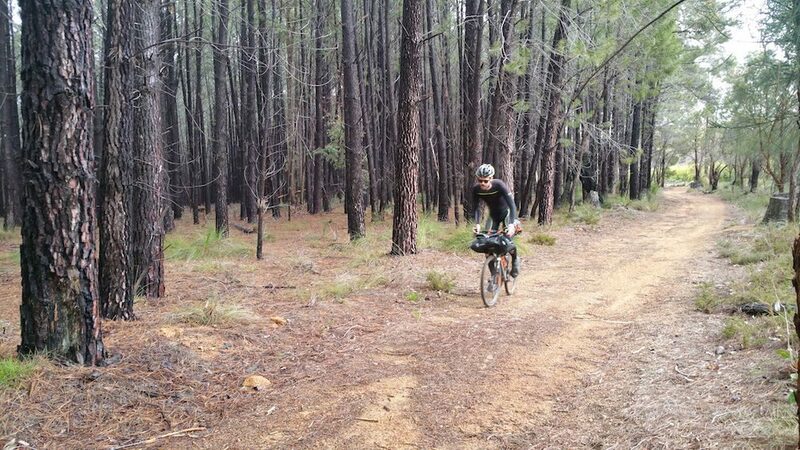 One of my favourite places to ride bikes is in the pine forest. How great do pine plantations smell!? PEA GRAVEL! 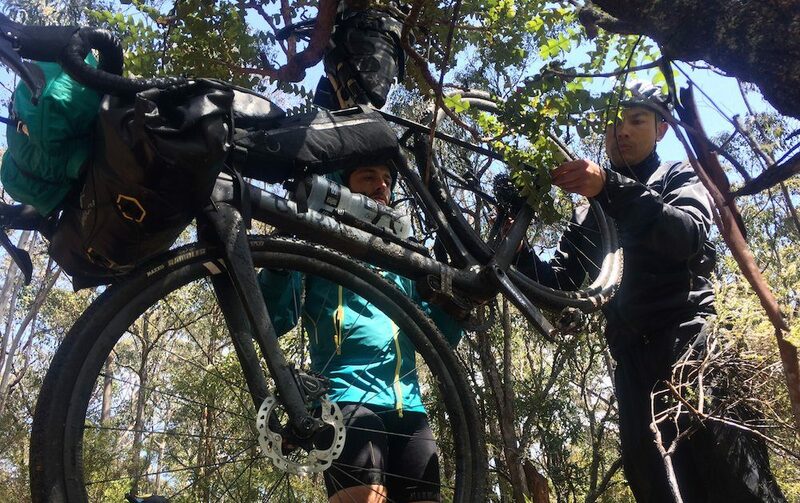 SV and I were well out of our depth on this stuff, our skinny tyres just ended up getting lost. 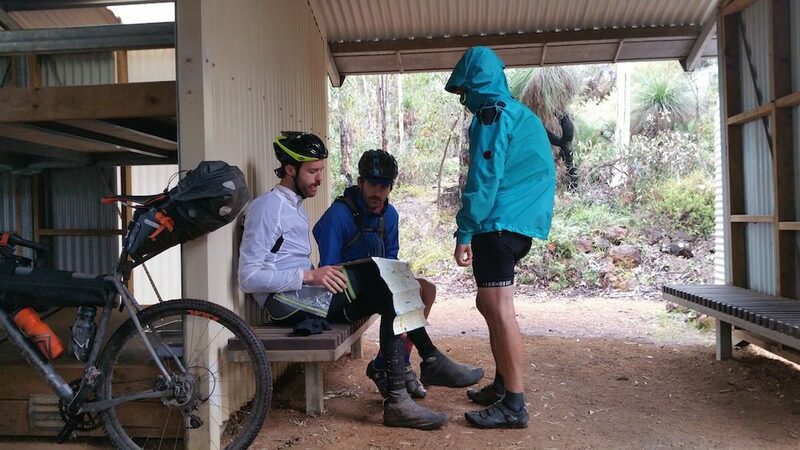 We waited for a few storm fronts to pass at the Damdelup shelter. Smart move. 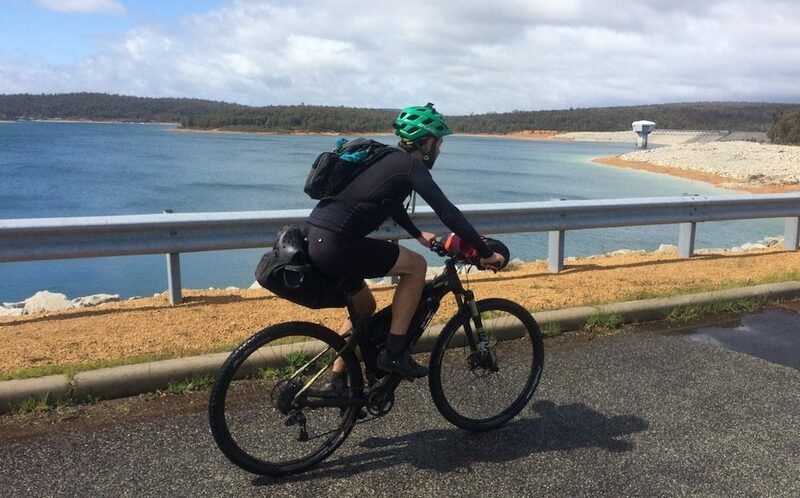 It was a nice change of scenery riding past the North Damdelup Dam wall. Given all the mining in the region, we passed underneath lots of mining infrastructure too. 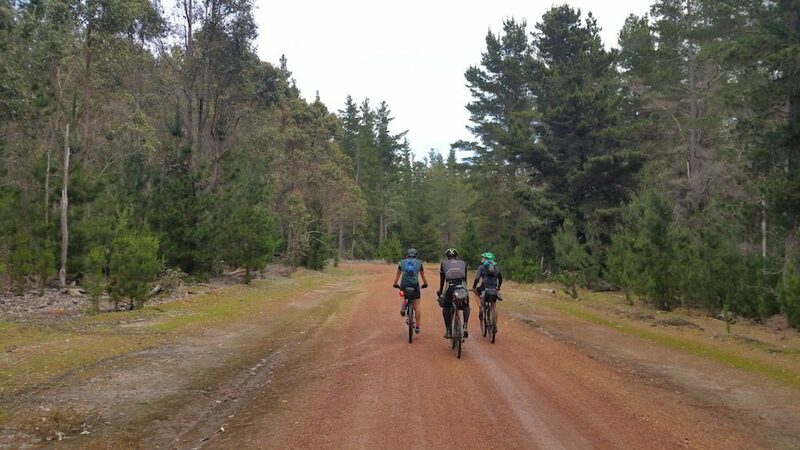 But then it was back to nature where we had some really nice gravel roads through long sections of pine forest. 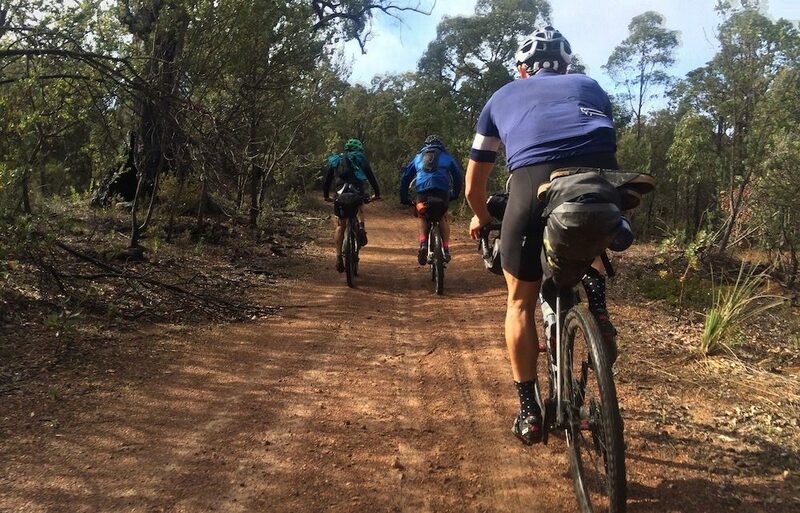 We were covering over 2x the daily distance of most Munda Biddi riders, so our stopping times were pretty restricted. But with all of the rain, we had to make the most of the brief periods of sunshine! 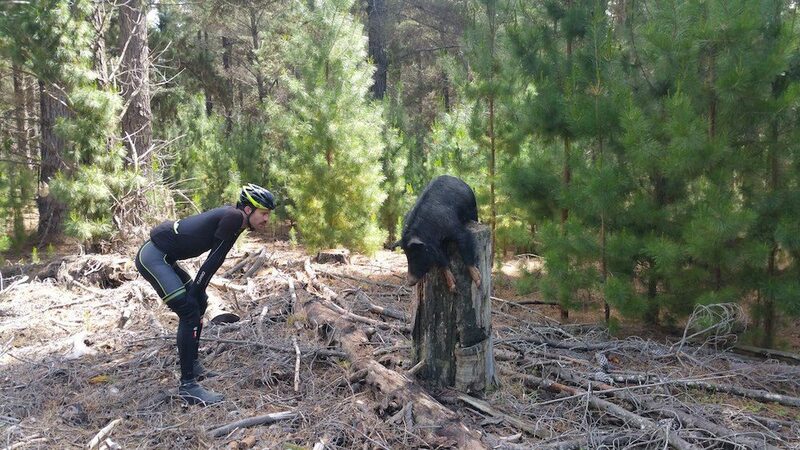 It was a bit sad and eerie seeing this wild pig shot and left to dry on a stump. Fires had devastated hundreds of square kilometres of forest near Lake Brockman. Trees were black as far as the eye could see. On the third day the weather gods finally delivered! Clear skies! Can you see the happiness?! 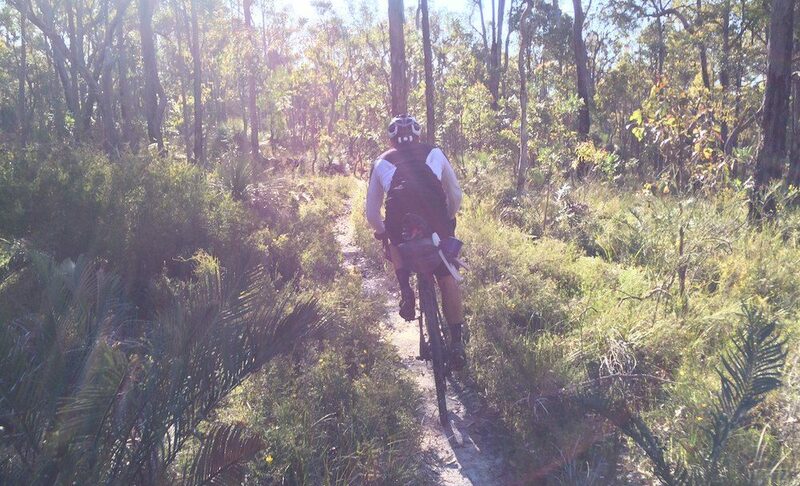 It was a weird sensation being able to ride with the warming sun on our backs. Some of the guys were even in short sleeves! 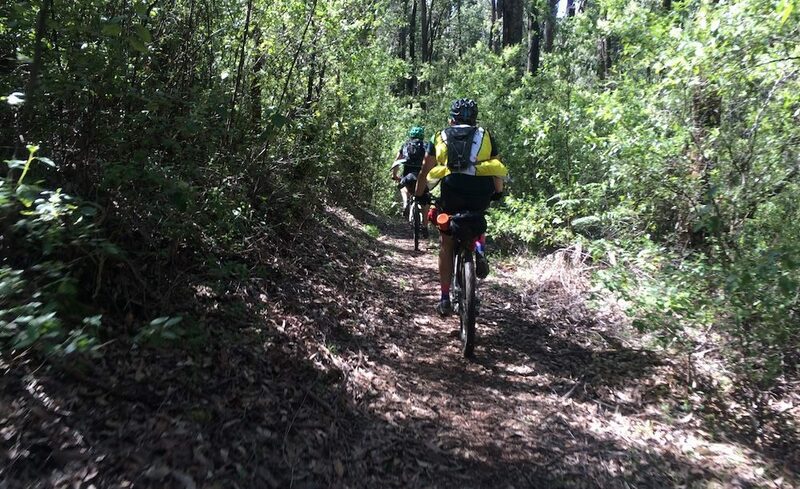 The trail had been a very high proportion of singletrack over the first few days. 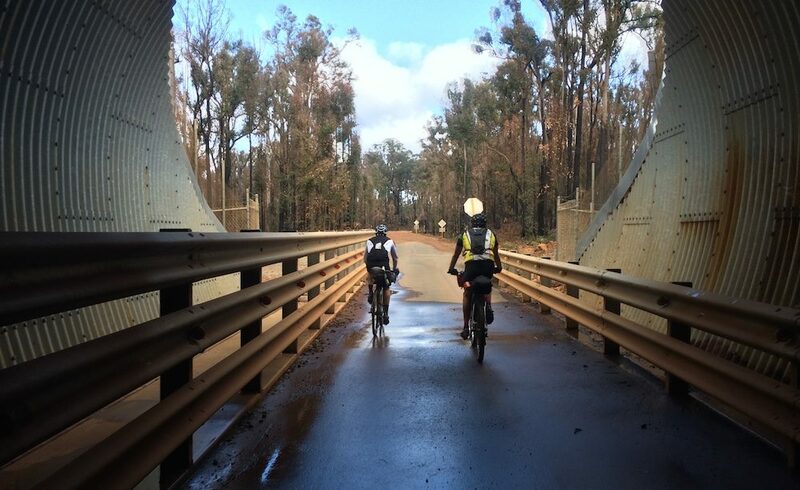 But the more technical sections of trail were near Wellington Dam (Collie). 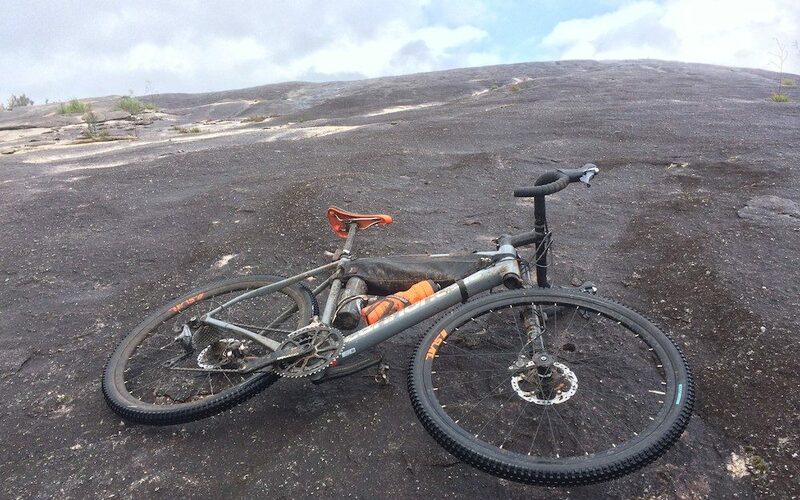 Although the Cannondale Slate could capably hold its own on the trail, it wasn’t the ideal bike for the job unfortunately. The section coming into Donnybrook from the north is absolutely stunning. 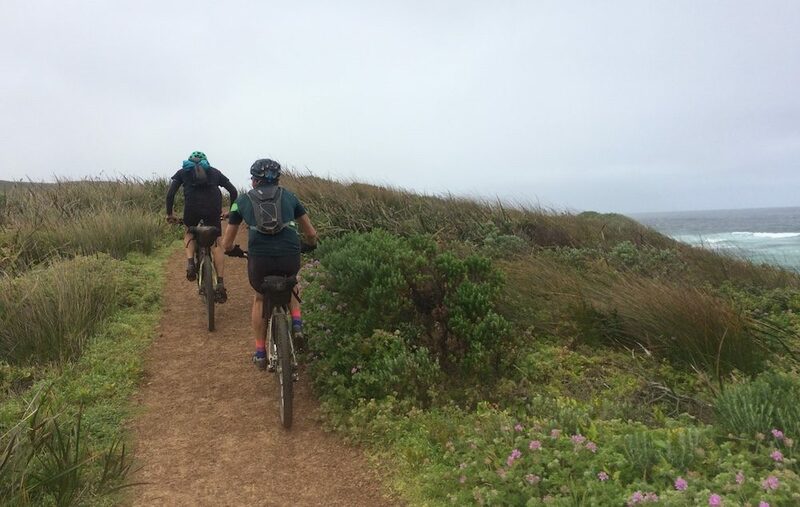 The route follows many ridgelines and offers great views. Given all the rain, the farming region was looking super lush. Even the bush was really green. This trail follows through a wildflower walk which was a fun little sector at sunset. 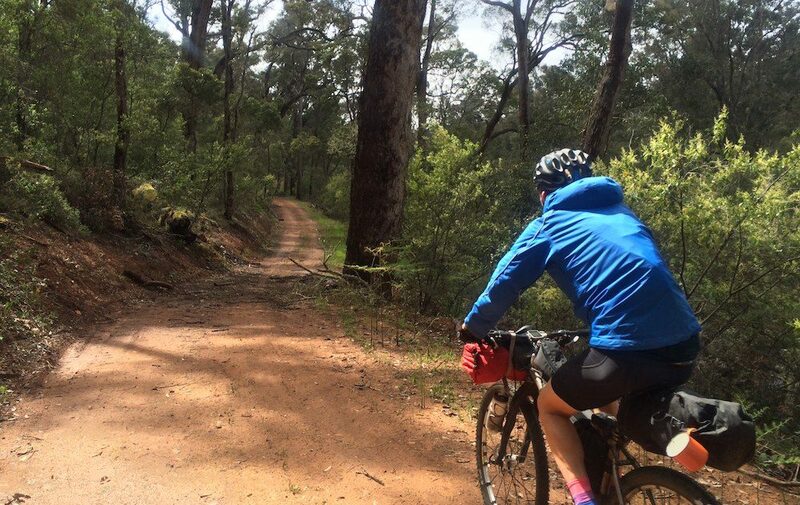 An old rail trail links up Jarrahwood and Nannup. The 1% gradients can be both a gift and a burden, depending on your direction! 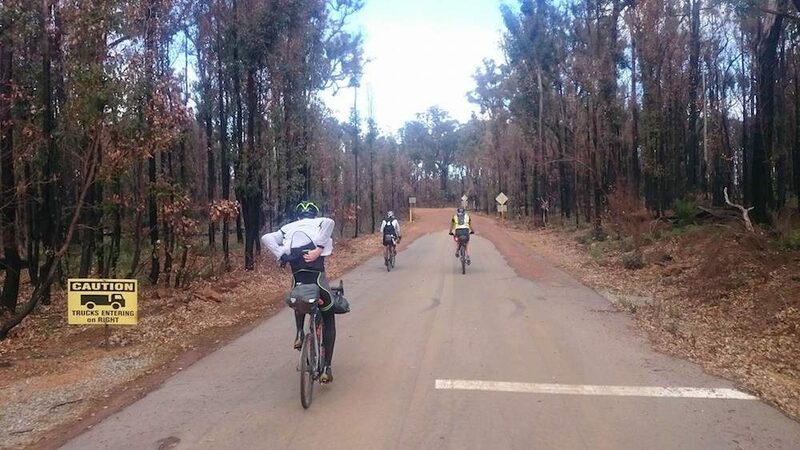 The weather forecast for our Nannup to Manjimup section was high winds, hail and storms. We stupidly went for it anyway given our tight timeline. But the storms were the easy bit. 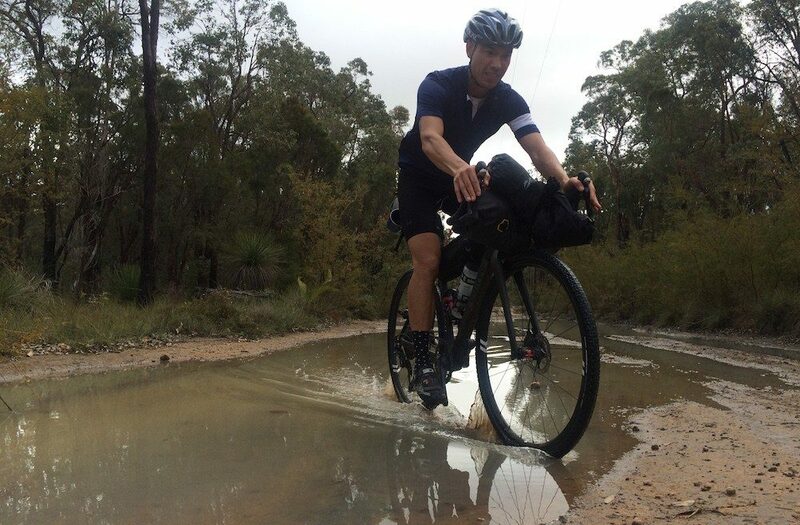 Steve was riding along when a stick went into his wheel, snapping a spoke and bending his derailleur irreparably. We took his derailleur off and turned his bike into a singlespeed, just before some unbelievably heavy hail. Our thermometer read 3 degrees!! 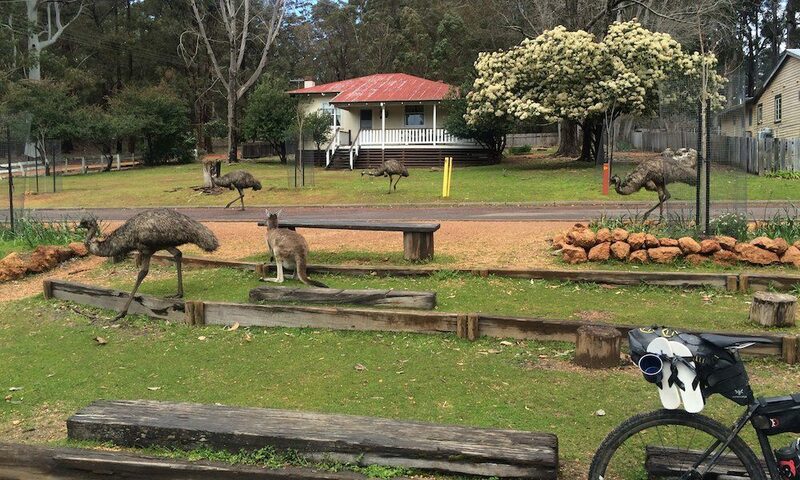 Does it get any more Australian than a mob of emus and a kangaroo walking down the street? 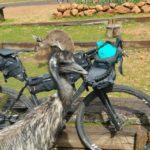 The emus and kangaroos at Donnelly River are very tame, as we found out. With Steve now on the singlespeed we split up for the first time. 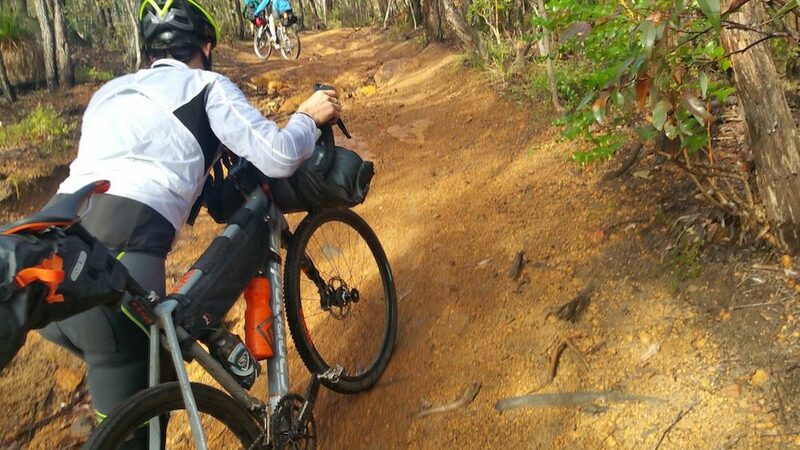 Steve rode the more direct route while the rest of us stuck to the trail. The trail was looking as lush as ever, but the weather was still on the wet side. 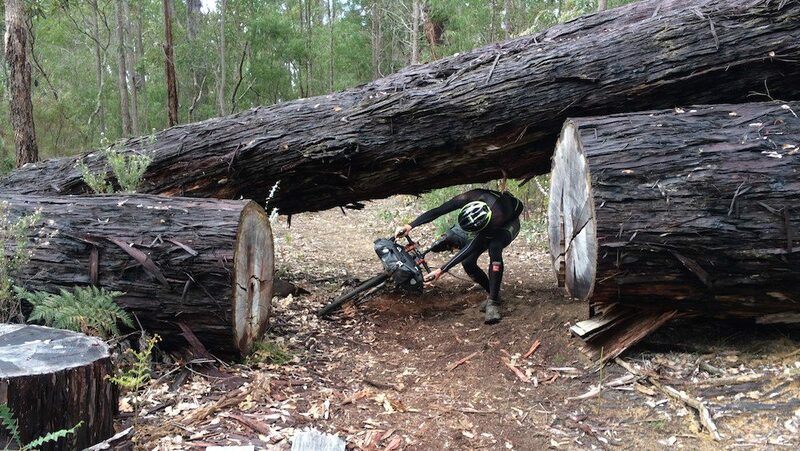 All of the storms had brought down hundreds of trees on the trail, which slowed progress. This one looks like it’d been down for a while however. Other sections had trees down, but for other reasons. Some of the most impressive trees that I’ve ever seen are in Pemberton. 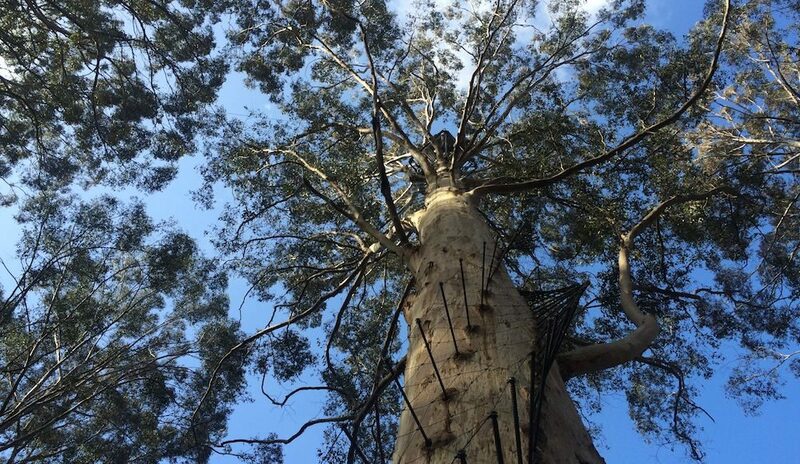 The Gloucester Tree has a series of metal stakes that have been hammered into its trunk. You can climb it up to 53m, but it’s not the faint hearted. I’ve never been afraid of heights before, but I did feel small rushes of adrenaline on the way up. 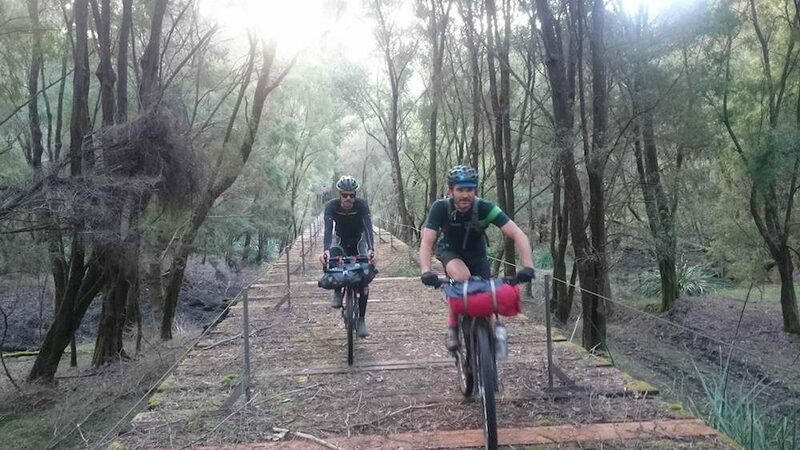 A lovely forest bridge to finish off the day. 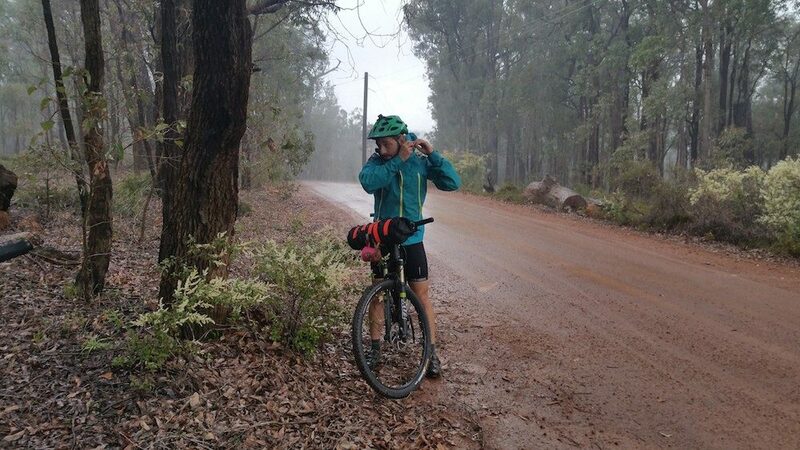 Despite how it looks here, it rained for the majority of our ride from Northcliffe to Walpole. 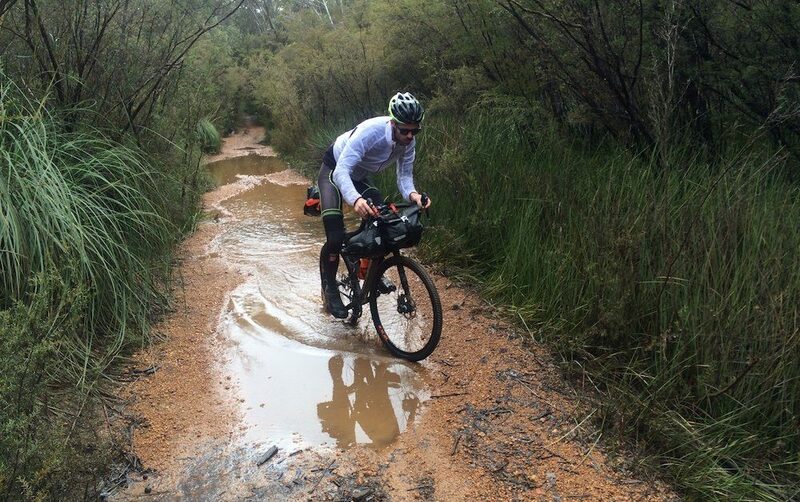 As we were approaching the coastal region, the waterlogged, sandy ground made it very tough going! An amazing granite rock sits behind the Kwokralup Beela campsite. The 360 degree views make it worth the climb. 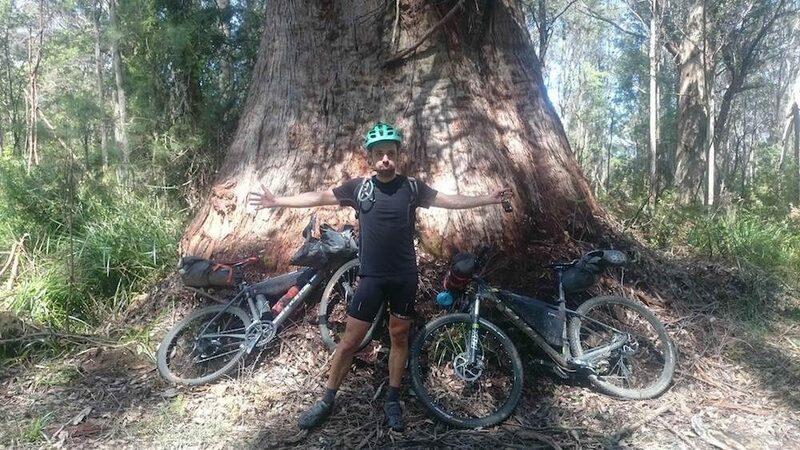 You can’t imagine how large the Giant Tingle trees are near Walpole. Some measure 24m around their base! 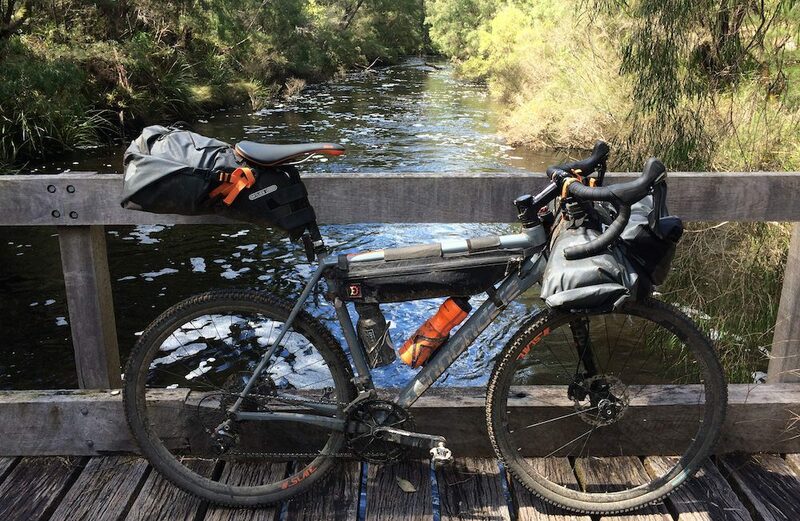 The Cannondale Slate at a river crossing near Walpole. The warmest day of our ride (20 degrees) allowed for short sleeves. 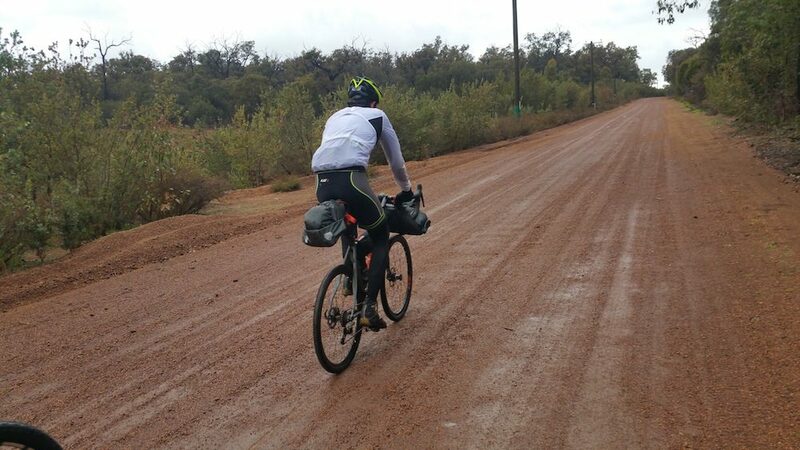 The road was hard work in the sun because of quantity of sand combined with the gravel. 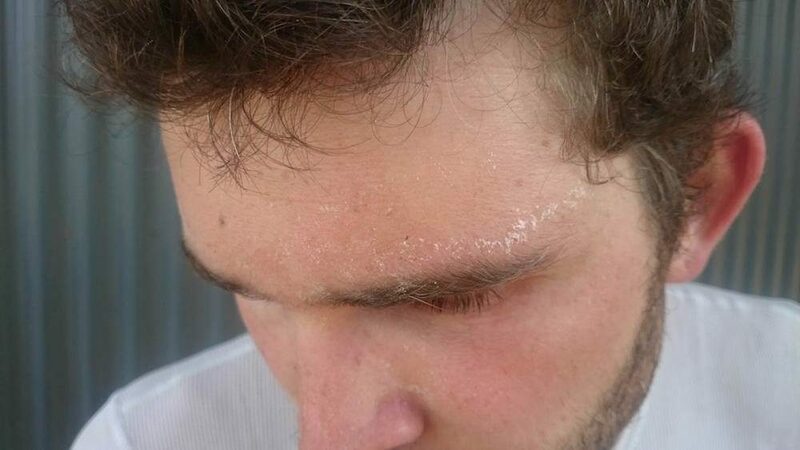 The salt on Campbell’s brow from the hot, sweaty, sandy riding. It was a dry day, but we had a new challenge to contend with now: flooding. The tannin-rich water was a very unique experience. 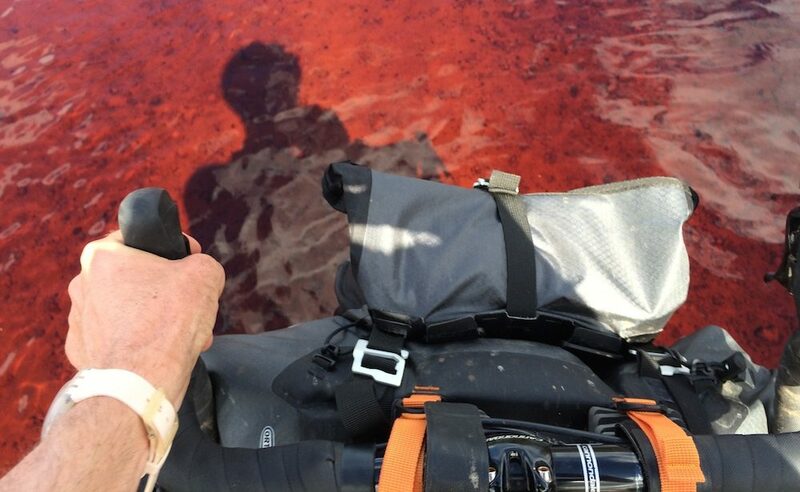 I’ve never seen red water like this before! 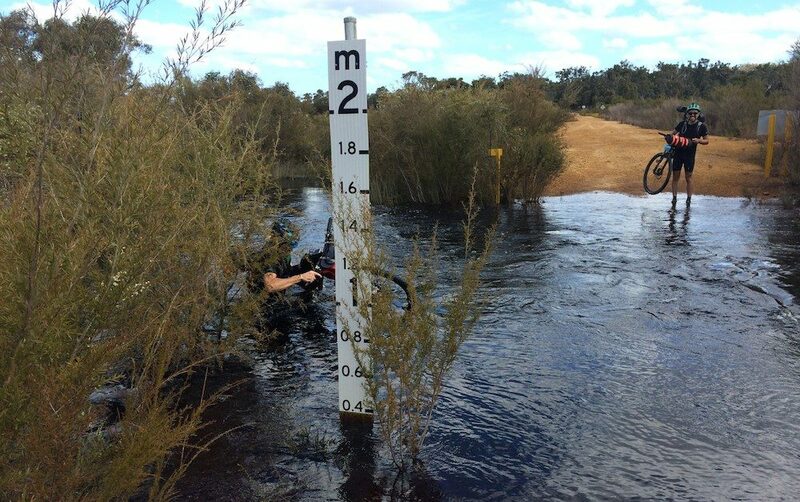 After I successfully rode through this 50cm deep river, Campbell had a crack but came off second best! Luckily skin is waterproof. His iPhone, not so much. 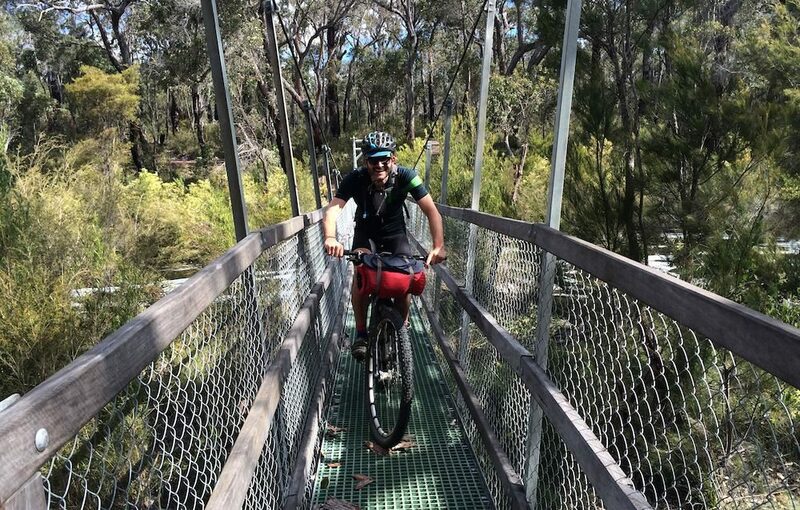 Campbell was happy to use this suspension bridge for the larger river crossing. 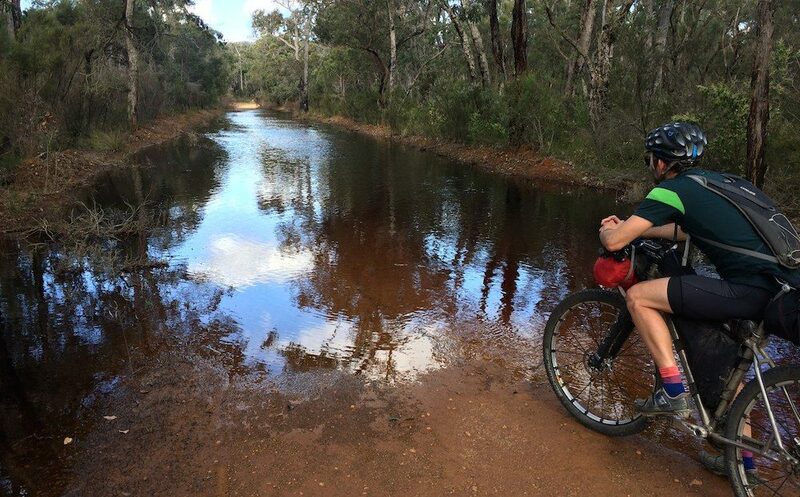 A 200m stretch of water ran down the road near the Jinung Beigabup campsite. The only way past it, was straight through. We walked the majority of it to make sure that no more phones had to die. The folk around Denmark are creative with their letterboxes. There were dozens of letterbox sculptures along this section. The trail followed the water for a short period which was one of the highlights of the whole trail. We made it to Albany! 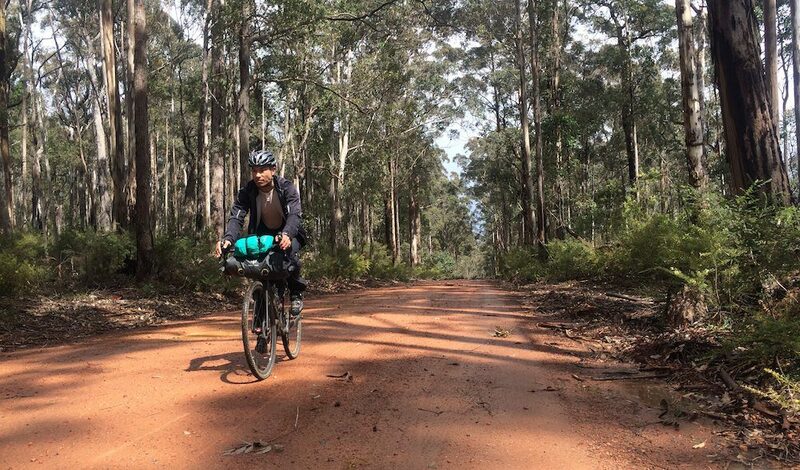 The 1000km+ Munda Biddi Trail in 10 days. 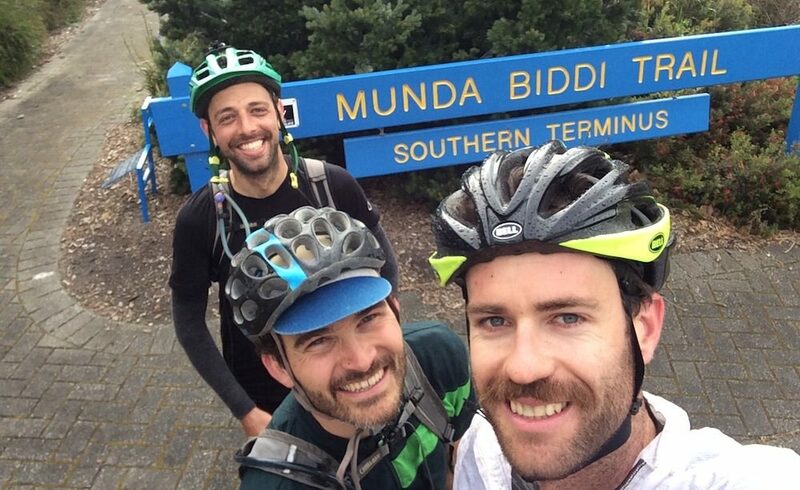 After finishing the Munda Biddi Trail, I jumped on a 6-hour TransWA bus back to Perth. 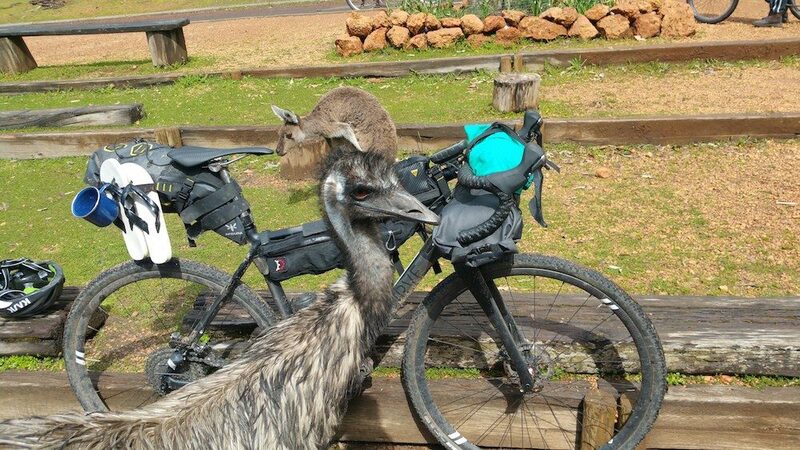 The cost was $65 AUD and it was another $10 AUD for the bike. They didn’t mind the bike being fully assembled. 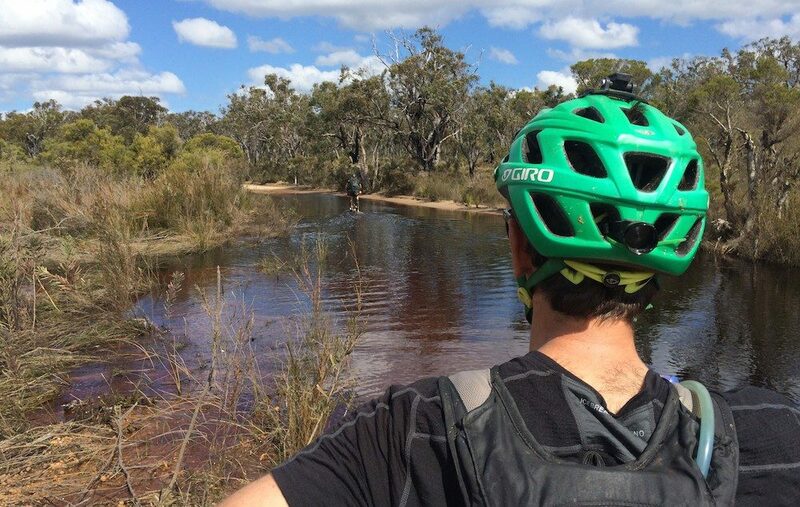 The Munda Biddi Trail is an incredible piece of cycling infrastructure. It is signposted really well, but not to the point where you can do it without mapping. The paper maps are great to study, and well worth the investment of about $100. 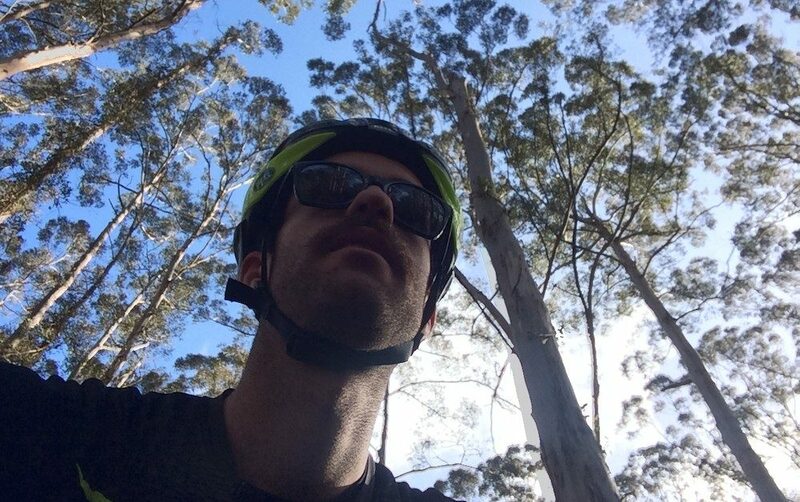 I wouldn’t recommend any bike other than a mountain bike for this ride. 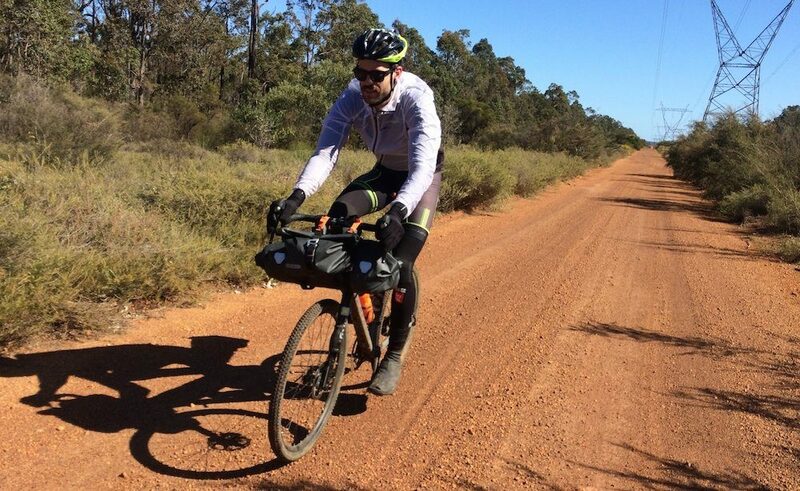 It’s possible to ride a bike with narrower than 2.0″ tyres – but it’s slower, less comfortable and simply not as enjoyable. 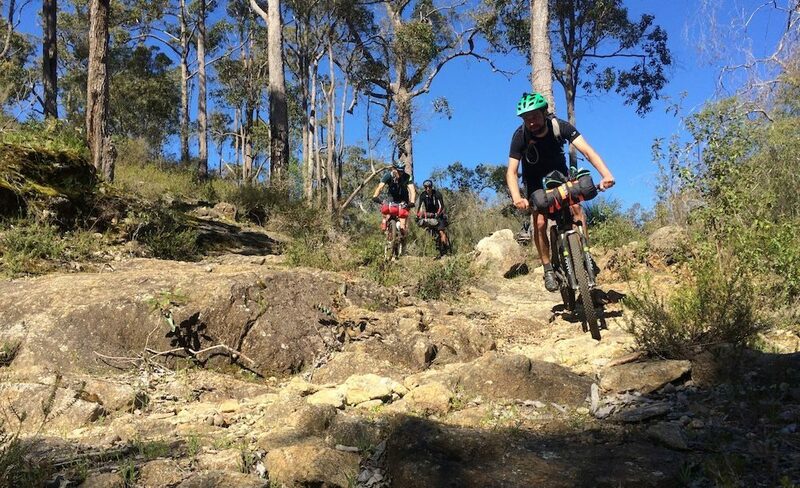 Mountain bikes will give you the low climbing gears necessary for every section of the Munda Biddi Trail, and the fat tyres will give you the traction and stability on the rough sections. I’d recommend packing light. 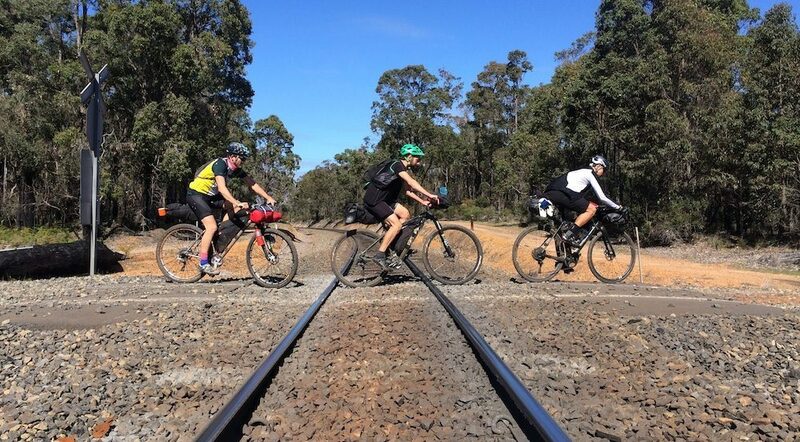 The best way to do this trail is without a trailer, and ideally without panniers. 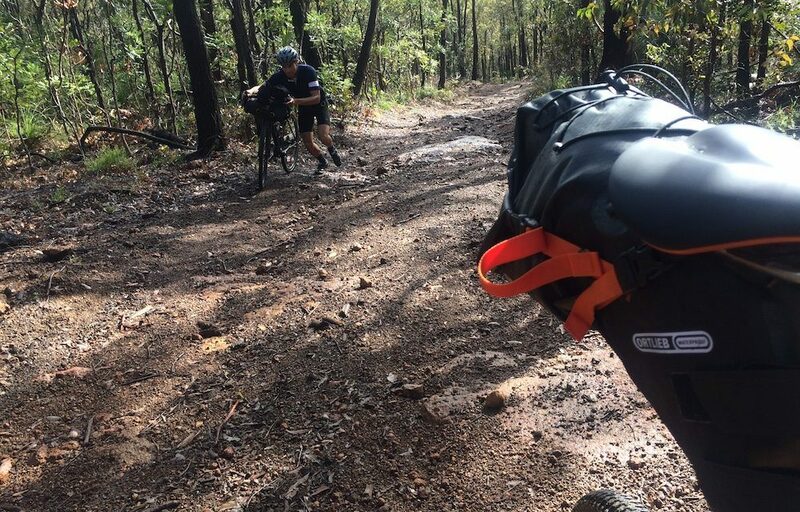 Bikepacking bags are without doubt, the best in terms of bike handling on the rough and technical trail sections. I was always pleasantly surprised by the state-of-the-art campsite huts located along the trail. You can ride hut to hut for the majority of the trail. You’ll find unfiltered water at each of the huts – I didn’t bother filtering the water; do this at your own risk. 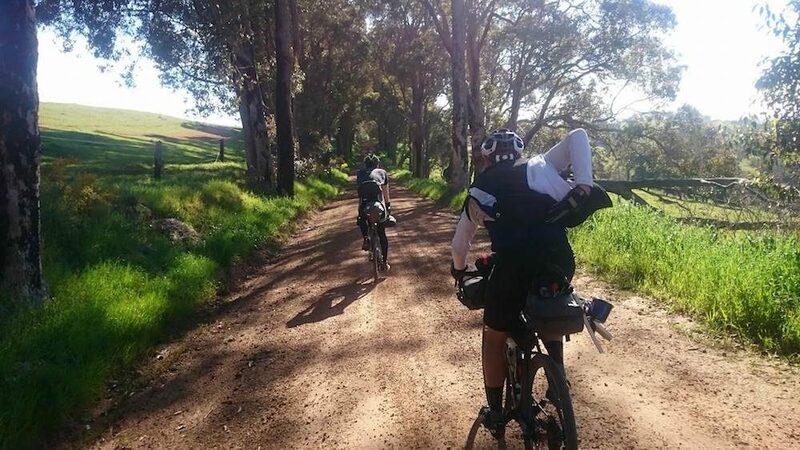 There’s accommodation available in almost all towns along the route too, but it’s best to book ahead if you can. 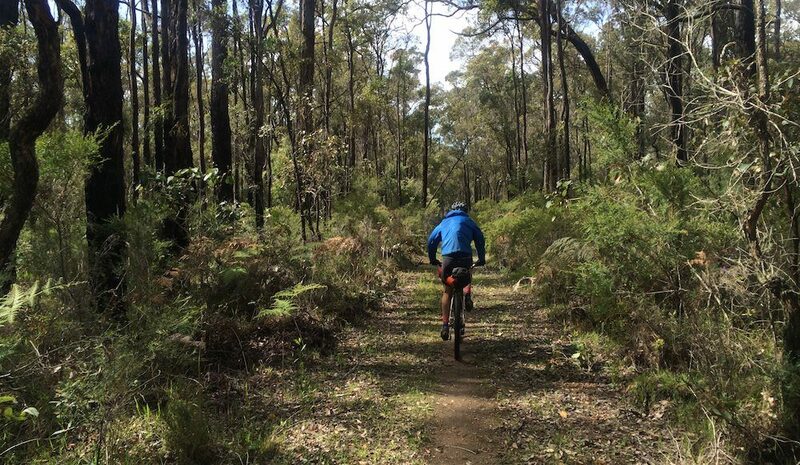 The Munda Biddi Trail is really hilly. It doesn’t look hilly on the map, but there’s some steep climbs littered throughout the trail. Be prepared! GPS Maps. 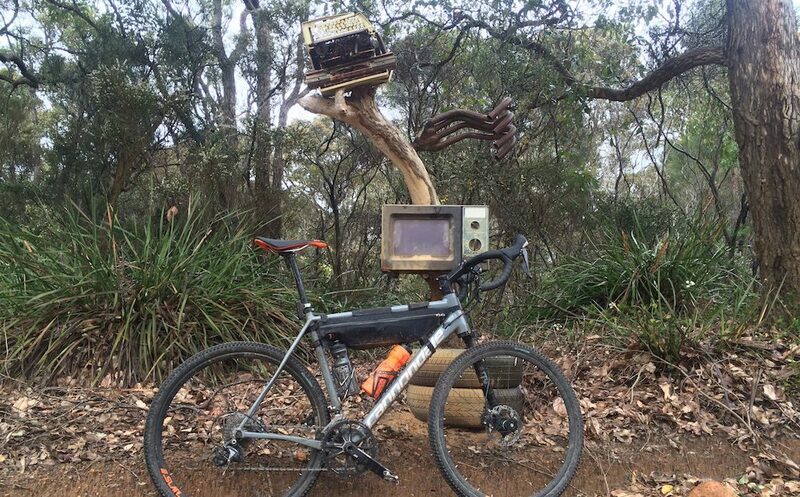 Some mostly accurate Munda Biddi Trail GPX files can be found HERE. More Information? 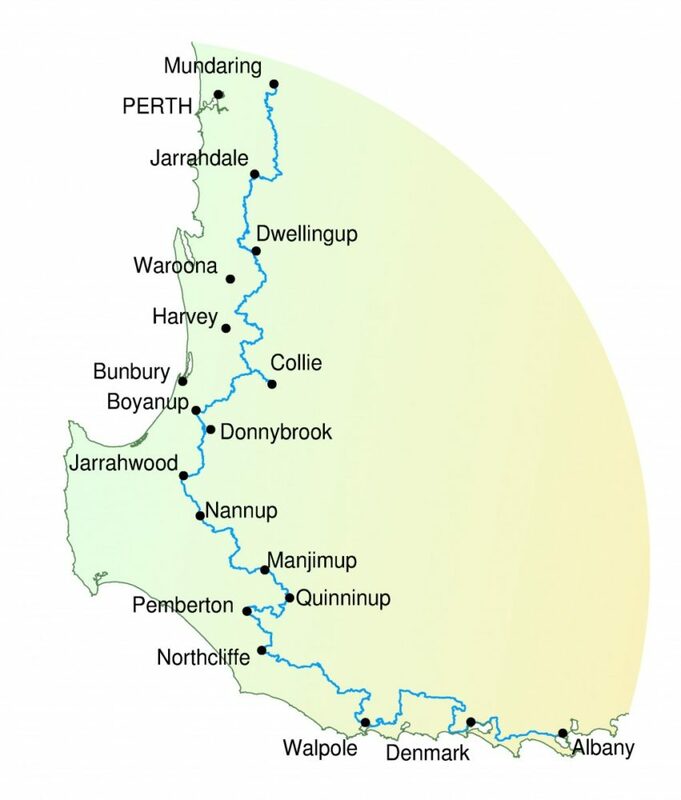 For detailed route information, head to the Munda Biddi Trail Foundation website. The rock formations around The Gap (Albany) are stunning.